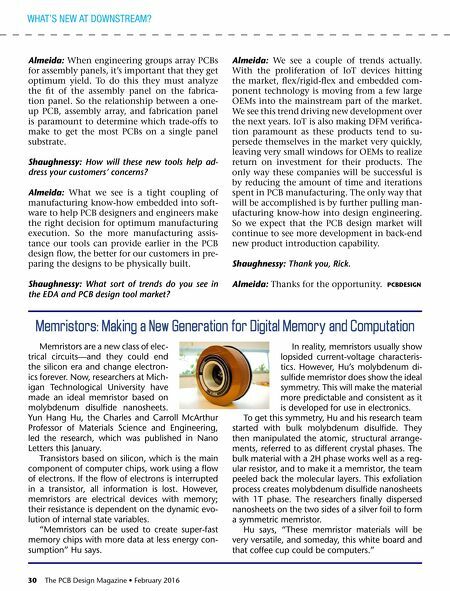 30 The PCB Design Magazine • February 2016 Almeida: When engineering groups array PCBs for assembly panels, it's important that they get optimum yield. To do this they must analyze the fit of the assembly panel on the fabrica- tion panel. So the relationship between a one- up PCB, assembly array, and fabrication panel is paramount to determine which trade-offs to make to get the most PCBs on a single panel substrate. Shaughnessy: How will these new tools help ad- dress your customers' concerns? Almeida: What we see is a tight coupling of manufacturing know-how embedded into soft- ware to help PCB designers and engineers make the right decision for optimum manufacturing execution. So the more manufacturing assis- tance our tools can provide earlier in the PCB design flow, the better for our customers in pre- paring the designs to be physically built. Shaughnessy: What sort of trends do you see in the EDA and PCB design tool market? Almeida: We see a couple of trends actually. 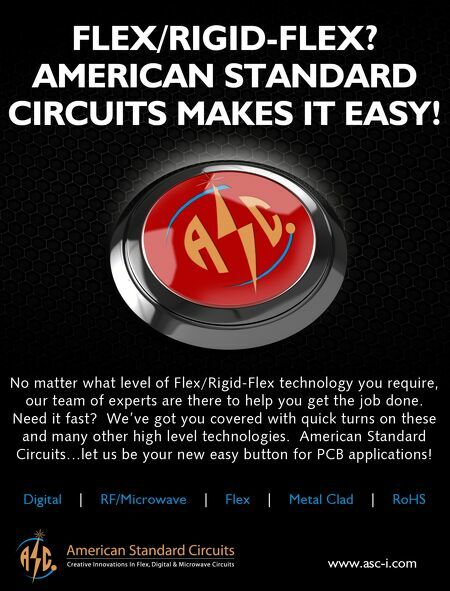 With the proliferation of IoT devices hitting the market, flex/rigid-flex and embedded com- ponent technology is moving from a few large OEMs into the mainstream part of the market. We see this trend driving new development over the next years. IoT is also making DFM verifica- tion paramount as these products tend to su- persede themselves in the market very quickly, leaving very small windows for OEMs to realize return on investment for their products. The only way these companies will be successful is by reducing the amount of time and iterations spent in PCB manufacturing. The only way that will be accomplished is by further pulling man- ufacturing know-how into design engineering. So we expect that the PCB design market will continue to see more development in back-end new product introduction capability. Shaughnessy: Thank you, Rick. Almeida: Thanks for the opportunity. PCBDESIGN Memristors are a new class of elec- trical circuits—and they could end the silicon era and change electron- ics forever. now, researchers at Mich- igan Technological University have made an ideal memristor based on molybdenum disulfide nanosheets. Yun Hang Hu, the Charles and Carroll McArthur Professor of Materials Science and engineering, led the research, which was published in nano Letters this January. Transistors based on silicon, which is the main component of computer chips, work using a flow of electrons. If the flow of electrons is interrupted in a transistor, all information is lost. However, memristors are electrical devices with memory; their resistance is dependent on the dynamic evo- lution of internal state variables. "Memristors can be used to create super-fast memory chips with more data at less energy con- sumption" Hu says. In reality, memristors usually show lopsided current-voltage characteris- tics. However, Hu's molybdenum di- sulfide memristor does show the ideal symmetry. This will make the material more predictable and consistent as it is developed for use in electronics. To get this symmetry, Hu and his research team started with bulk molybdenum disulfide. They then manipulated the atomic, structural arrange- ments, referred to as different crystal phases. The bulk material with a 2H phase works well as a reg- ular resistor, and to make it a memristor, the team peeled back the molecular layers. This exfoliation process creates molybdenum disulfide nanosheets with 1T phase. The researchers finally dispersed nanosheets on the two sides of a silver foil to form a symmetric memristor. Hu says, "These memristor materials will be very versatile, and someday, this white board and that coffee cup could be computers." Memristors: Making a New Generation for Digital Memory and Computation what's new at downstreaM?